A basic personal information form is a document which is used by organizations and institutions to collect necessary data from an individual, such as an employee, a group member, or a student. Since the data to be disclosed in the form can be confidential, the organization who collects the completed forms should ensure that they can implement efficient data protection and security. Moreover, the form is often accompanied by a confidentiality agreement and a legal consent statement which centers on documenting the approval of the data owner towards the intents of the organization to use the disclosed data. 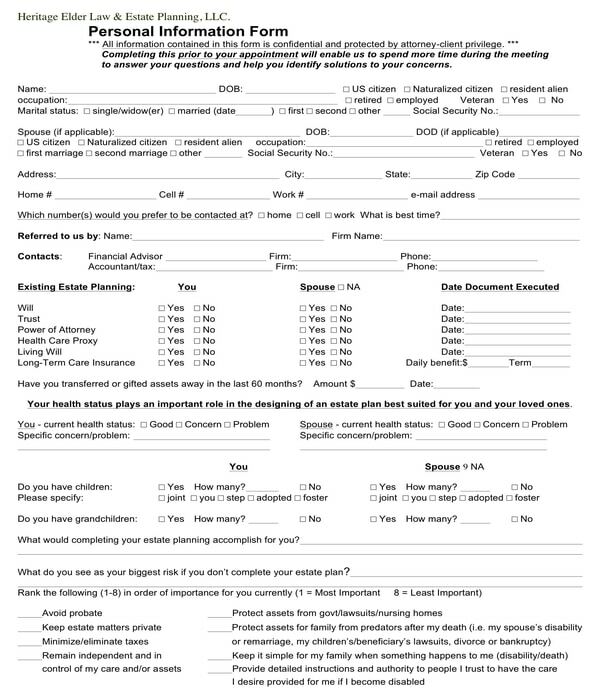 Another document that accompanies a basic personal information form is a change request form. The purpose of a change request form is to inform an organization that the data owner wants to update his previously recorded information. The change request will state the data to be changed along with the reasons why the change must be executed. What Types of Data Are Collected in a Basic Personal Information Form? Contact information: An individual’s contact information includes the user’s full legal name as registered in the State or country, his active personal and work phone numbers, his electronic mailing addresses, and the fax number of his office. Addresses: The term “address” not only refers to the residential address where the user of the form is living in but also his work address and the country where he came from if he is a foreigner. Health care history: The purpose of knowing the health care history of the user is to document what his needs are in lieu of his medical condition, especially if the organization requiring the completion of the information form is a health care group or a medical institution. Specifically, in the health care history section of the form, the user’s physical and mental disabilities can be included as part of the data to be disclosed, as well as, the user’s physical measurements, the list of maintenance medicine he is taking, and the surgeries that he had undergone. Associations: This refers to the organizations that the user is participating in as an enrolled or a registered member. The list of associations will provide insight to the organization about what the interests of the user are. Employment, educational, and criminal history: The need for identifying and documenting the history of the individual is to determine his qualifications and eligibility for an application procedure. The employment or work history of the user will disclose the companies where he previously worked in and the number of years that he was able to retain his employment status. The user’s educational history, on the other hand, is for determining his educational level and whether he obtained certifications and awards relevant for his application. Lastly, the criminal history of the user will inform the organization of the offenses and the lawsuits that the user has gotten involved in, as well as whether the cases have been resolved or is still in the process. 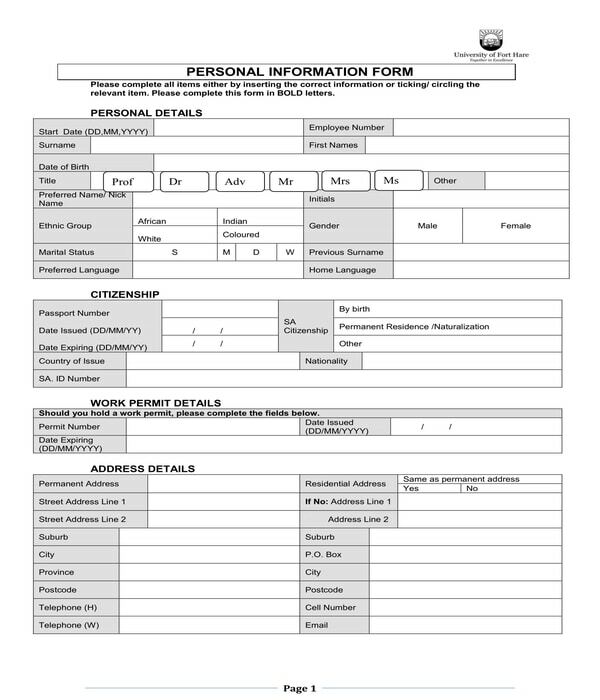 Applicant Personal Information Form – Immigration organizations whose goal is to fulfill an immigrant selection process are the ones who prepare this form variety. In an applicant personal information form, there are three tables to be completed by the immigration applicant. 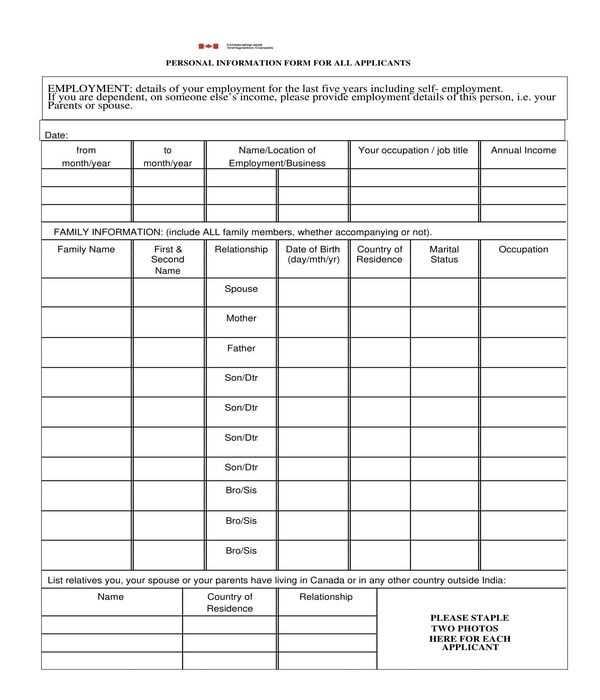 The first table is for the applicant’s employment details while the second table centers on the applicant’s family information, and the third table will have the list of the applicant’s family relatives who are living in a foreign country or State. Additionally, the photos of the applicant are also needed to be placed onto the allotted photo area in order to complete the form. 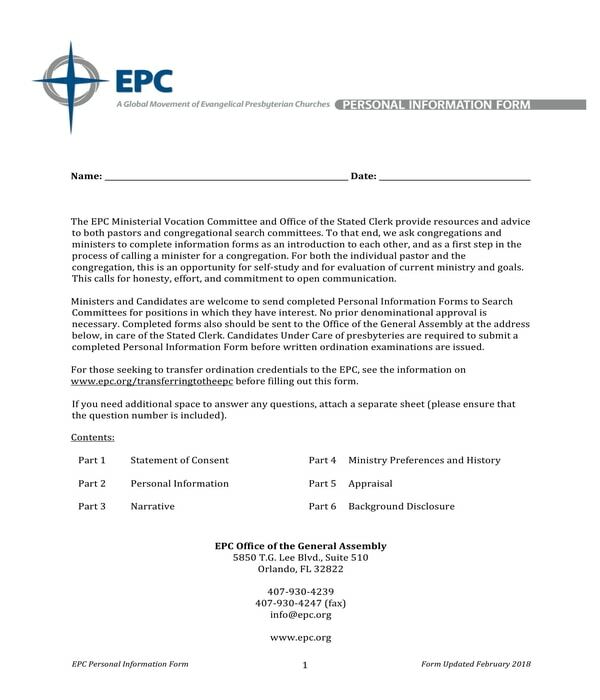 Church Personal Information Form – Even congregations use basic personal information forms, specifically for their pastors, ministers, and possible ministry candidates who plan to lead a church group. In the first page of the church personal information form, the user will need to state his name along with the date when he used. A statement of consent is incorporated in the second page of the form which should be signed by the user with his printed name, and an indication of whether he is open for a ministry call or not. The other pages of the form will collect the work history, ordination status, educational background, and the answers of the user from the sets of questions revolving within his religious beliefs and opinions. Estate Client Personal Information Form – Estate planning is not easy for the common man which is why there are attorneys and lawyers who offer estate planning services for property owners. An estate client personal information form is one of the documents that attorneys will require their clients to complete as a part of their client intake process. The form is composed of six sections which are all relevant for finalizing an estate plan. The first section of the form will gather the name, occupation, marital status, addresses, and the social security number of the client. The second section is allotted for disclosing the name of the person who referred the attorney’s services to the client, while the third section centers on the existing estate plans of the client if he had any. The fourth section contains the health details of the client, and the fifth and sixth sections are intended for the client’s family and financial information. 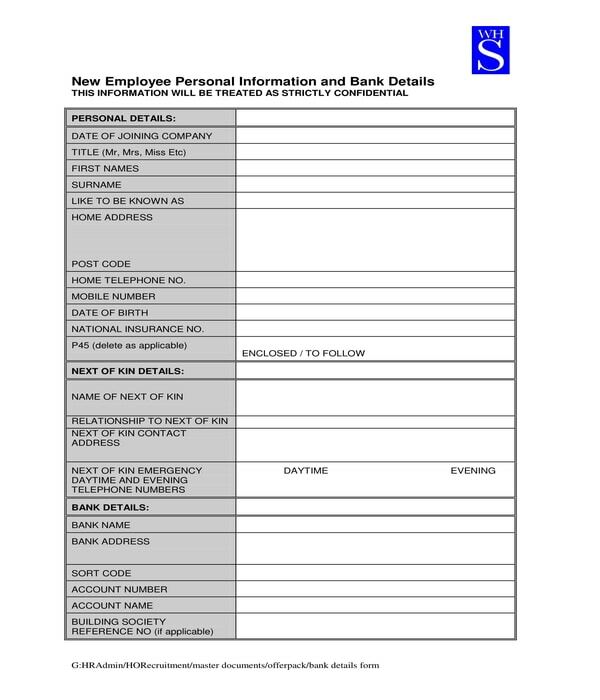 New Employee Personal Information Form – Companies and business organizations are the ones who use this form. A new employee personal information form will not only have the basic data of the newly hired employee but also his bank details for his salary and payment transactions. In addition, there is also a section in the form which is intended for the general information of the employee’s next of kin or dependent, and emergency contact person. 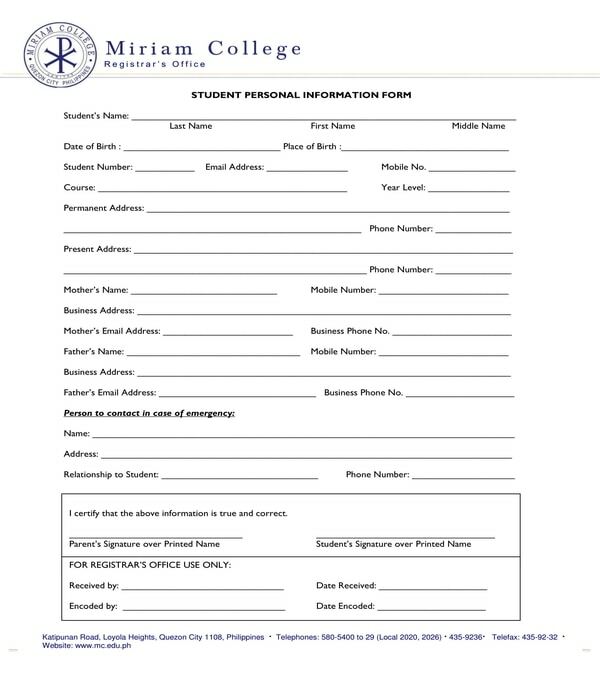 Student Personal Information Form – It is essential for a school registrar to have all the documents and records about a student, as well as a faculty member or a staff, who is still affiliated with the school. In lieu of this, student personal information forms are required by registrars to be filled out by their enrolled students. The form contains three sections wherein the last section is to be completed by the registrar. The first two sections are for the student’s details and his emergency contact information. To conclude, basic personal information forms are important documents, not only for recording the details of an individual but also for maintaining accurate information and for determining eligibility qualifications. Each information in the form, must, however, be kept and be used with strict confidentiality which is limited only within the organization who collected the form.